With a range of Telephone System connectivity options, @pabxdubai.com has the tools to support your business. The global trend in the area is to unify all communication media to interact with each other seamlessly and transparently. The Voice over IP server Panasonic KX-NS500 offers a complete set of functions and telephony communications network with a wide range of fixed and wireless terminals, headsets and softphones. System resources can be improved and easily extended through software applications and licenses to meet the needs of organizations with one or several locations. 's KX-NS500 has advanced mergers, starting from 6 analog lines and 18 extensions, up to 288 extensions with Expansion Unit. This product is also a unified communication system with IP advantageous features such as mobile communication, email and integrated voicemail, instant messaging (chat) and presence information. You can also use integrated applications like Call Center, mobile solutions and systems voicemails that provide greater efficiency and increase the level of customer satisfaction. 's KX-NS500 can be used as a hybrid system to help reduce costs and allow rapid return on investment. ability Proper NS500 IP combines IP and legacy as folly, to create a system that is flexible and cost efficiency lines. Connecting the KX-NS500 units in different offices with a connection IP, you can build a network that integrates voice and data. This allows calls between offices expand based on the IP network and reduce costs. 're System with IP network can use IP phones and extensions headquarters without installing an additional unit NS500 or special router. In other words migrate to IP network systems reduces installation costs. Also existing analogue and digital Panasonic owners can still be used, allowing the system to be replaced at a low cost without wasting resources. 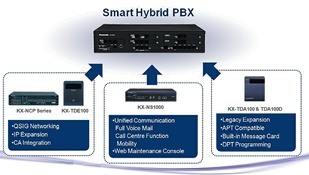 The new IP PBX Panasonic combine the reliability and performance. 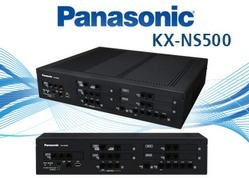 Panasonic KX-NS500 is presented in an elegant and intuitive Rack houses from the point of view of the connections. The front panel also serves as the main distribution frame to connect the network cables, telephone cables for analog phones, digital connections for auxiliary systems, intercoms dedicated Panasonic etc.There are LED indication and diagnostics, the USB port, the port connecting to the ethernet LAN, and the door to the control of electric locks. All connectors are standard RJ. It is installed in a very short time thanks to the management console via the Web, the ability to connect VoIP telephone terminals fixed with auto-provisioned (if installed component IP - DSP). This feature makes it possible to connect VoIP phones that self identify with the central system by avoiding the installer configuration for each phone. Panasonic NS 500 With the installation and management of the system becomes faster and reduce costs. A shouldered times you can manage through Web browsers a range of functions with various levels of permission in order to ensure stability system and prevent unauthorized access there are system configuration by users. Users still have the option to customize your desktop, phone or services of your terminal. fact, this system supports VoIP phones owners such as the NT series, UT, but also mobile software Panasonic, operator consoles, Built-in application for the management of statistical analysis of system calls, the supervisor console, and of course the ability to integrate devices such as tablet with Android or Apple iOS , laptops, smartphones and all those devices equipped with wireless technology to access the data network Internet. You can also connect standard SIP VoIP lines, phones and softphones always with standard SIP also third parties like Bria, Zoiper etc..
One of the coolest looking for small and medium size companies and even the ability to manage the cordless DECT terminals for wireless communications in the company, without necessarily having to use the phones. This requirement is solved through the installation of multi-cell DECT connected on the LAN or demotivated in other locations connected to the network. The proverbial efficiency of Panasonic DECT and then updated to the new IP technology ensuring highest quality of both sound level and reliability. Panasonic DECT terminals are available in different versions with protection from bumps and level of IP 65. Taking advantage of the licenses, the system can be expanded in its capabilities and capacity, and functions to achieve third-party VoIP devices such as VoIP intercoms , video VoIP, IP phones, Wi-Fi and so on. The basic unit of Panasonic NS500 provides the service of automated voice operator , with customizable messages, automatic switching based on the daily working hours per week. system voice mail , lets get to leave messages either from peers or external caller if the Our phone was busy every State not to disturb or be set voice mail forwarding feature on a voluntary basis. messages are notified in any case, so you can recall without losing customers and business opportunities without neglecting relationships with colleagues.